I’m delighted to be taking part in the blog tour for this very original and thought-provoking dystopian mystery. The year is 2039. The setting is the British Isles – but not the British Isles as we know them today. The brutal economic impact of the United Kingdom’s withdrawal from the EU, together with the ever-accelerating effects of global warming have led to a very different environment indeed, in almost every way. Politics, geography and technology are all in flux. But some things remain the same – greed, murder, conspiracy and corruption among them. When Stephanie Flack, licensed private eye in the Royal Province of Anglia, is asked to track down some missing diamonds, she soon finds the trail leading her into some very unexpected and highly dangerous places, with dead bodies appearing with alarming regularity. Including, very nearly, her own. R M Cartmel’s skilful characterisation, sharp observation and quiet irony provide a glimpse into a future which we can almost recognise. A brilliant, gentle, wry dystopian murder mystery. 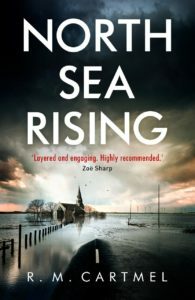 North Sea Rising is a gritty, imaginative political noir thriller – a potent combination! The author has used his imagination to create a bleak future for the UK, but one that is actually perfectly feasible given the chaos that a hard Brexit might easily result in. Mix in climate change resulting in rising sea levels swallowing chunks of the country, thus putting extra pressure on the remaining land and resources and adding to the existing considerable tension between the various provinces into which the nation is now divided, and things are bound to get pretty exciting. They certainly do in this novel. Private detective Stephanie Flack is our main character. She is capable, lively and confident. She’s very likeable and makes for a great heroine. DCS Siobhan Flynn, aka Shove, shares a house with Stephanie, and also Mr and Mrs Grubbs, refugees from when The Wash was immersed by the rising sea level. There’s also Sabrina, Steph’s secretary, and Dwayne, her associate. There’s an assortment of other equally interesting people to come across, and their interactions are always enjoyable. As described in the blurb, the main thrust of the story is Stephanie’s investigation of missing diamonds and their equally missing courier, and all the trouble this leads her into. There are other minor incidents too, such as a short thread of the story that involves disappearing e-books, something I particularly enjoyed. In the background the volcano in Yellowstone Park is erupting, humans are beginning to colonise Mars. References are made to the new technology of this time, such as pods for travelling, wristies (tiny wearable computers), 3D tablets and airships. What’s more, academics are governing things these days, a great improvement on the “half witted idiots” who facilitated Brexit. There are so many clever touches like this in the writing and so you’re constantly surprised and impressed. It’s a very mobile book, in that’s there lots travelling around, lots of momentum and impetus. There are many different settings to the action, and most of them are somewhat desolate and ominous. For example, there’s snow in August at the start of the book, and later we encounter with Stephanie the roofs of houses sticking out of the water that is reclaiming the land. Because of the ‘busyness’ of this book, the pace is high and it’s a real page-turner with lots happening, and a little bit of romance too. There’s an extra twist in the ingenious plot that gives us a cliff-hanger ending so we’ll be meeting Stephanie Flack again in another adventure, which is very good news. So in conclusion, this is an unusual, thought provoking and intriguing novel. Absolutely one to read. 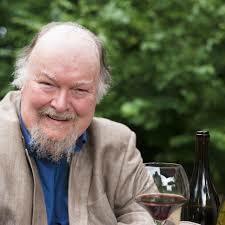 Following a highly successful career as a GP, RM Cartmel returned to his first love and took up writing again. Well-known for his wine and crime series set in France, The Inspector Truchaud Mysteries, he also has a second, rather more offbeat series of North Sea Noir, which can be read as stand alone but connected novels, set in Peterborough. North Sea Rising is the second of these.